EDDIE THOMAS, TREORCHY, NEATH & CARDIFF. CARDIFF v NEW ZEALAND 21 NOVEMBER 1953 PLAYER'S ARCHIVE - Probably the greatest day in Cardiff's illustrious history - beating the mighty All Blacks 8-3 at Cardiff Arms Park. Captain of Cardiff that day was Bleddyn Williams who, 4 weeks later, captained Wales to victory over New Zealand (13-8), for a unique double. This group of Eddie's includes his selection card to play in the match, match programme, post match dinner menu, photograph of both teams, specially commissioned blazer badge for the game, newspaper cutting from Daily Mirror of match report, congratulations letter from Treorchy & District Male Choir, facsimile copy of Cardiff team photo. 8 items in generally good condition. Edwin Thomas who was known as Eddie, played at lock. His first senior rugby was for Neath and he played for the combined Neath and Aberavon side against the Springboks in November 1951. In the same season he was selected for a Welsh trial as a wing forward - his future team mate Malcolm Collins was on the opposing side, Eddie joined Cardiff at the start of the 1952-53 season and readily admits that he was prepared to play in any position to cement a place, although not over-enthusiastic about one suggestion that he should he tried out at prop. He acquired the nickname Toesy Thomas because in the team photograph for the All Blacks match he can be clearly seen standing on his toes to make himself seem as tall as Malcolm Collins! He was considered to be a very good club captain because he knew the game inside out and led from the front. He retired with 217 games for Cardiff to his name and for a while served on the Cardiff committee. (Adapted from'Taming the Tourists' by Alan Evans). Accompanied by a certificate guaranteeing it's authenticity................ 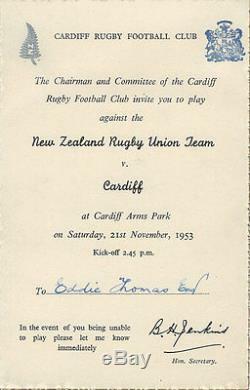 The item "CARDIFF v NEW ZEALAND 21 NOVEMBER 1953 PLAYER'S ARCHIVE EDDIE THOMAS COLLECTION" is in sale since Tuesday, September 3, 2013. This item is in the category "Sports Memorabilia\Rugby Union Memorabilia\Other Rugby Union Memorabilia". The seller is "rugbyrelics*com" and is located in UK based - ship next day. This item can be shipped worldwide.